The vehicle runs in combination withthe gasoline and electric power. Payspecial attention to the following items. Be careful of high voltage and hightemperature. Your vehicle is equipped with the orangecolored cables connected to the hybridbattery (about 200 V) and to other componentsthat are all high voltage. Do not touch or come in contact withorange cables or battery terminals.Electric shock may cause serious injuryor death. Read all caution labels. An electric motor, coolant radiator andsome other parts reach high temperaturewhile driving. Caution labels are applied tothese parts. Carefully observe the instructionson these caution labels. Never remove or disassemble anyhigh voltage part, high voltage cables(orange color) and their connectors.It may cause death or serious injury. Do not touch the service plug. The service plug is installed in the leftside trim of the luggage compartment. Itis provided to disable high voltage currentfrom the hybrid battery when the vehicleis in need of repairs at your Toyotadealer. The shaded parts in the illustrationare subjected to high voltage. Inappropriate handling may causean electric shock resulting in seriousinjury or death. Never touchany item in shaded area. These high voltage parts or cablesconsisting of an electromagneticshielding structure produce relativelythe same amount of electromagneticwaves as conventional gasoline−fueled vehicles or home electric appliances. As unwanted noise may occur in thereception of mobile radios, contactyour Toyota dealer for installation orremoval. Always keep your hybrid vehicle’s drivingcharacteristics in mind. The driver should pay full attentionaround the vehicle especially when itis driven only by the electric motor(with the gasoline engine stopped).People in the immediate area mightmisjudge the hybrid vehicle movementbased on the absence of theregular engine noise. As the vehicle runs with both the gasolineengine and electric motor, you mayhear a motor sound coming from theengine compartment. When the hybrid system is started orstopped, you may hear a sound comingfrom the hybrid battery in the luggagecompartment. However, this does notindicate any trouble. If the “READY” light is on, you canstart even though the gasoline enginemay be off. When you shift the shift lever to “B”and release it to its original positionand your foot from the accelerator pedal,engine braking will be applied. However,during high speed driving youmay feel that deceleration by enginebraking is less than that of ordinaryvehicle. Be sure to put the hybrid transaxle in“P” when parking. In “N”, the hybrid battery assembly is notcharged, even if the gasoline engine isoperating. You cannot run your vehicle ifthe hybrid transaxle is left in “N” for along time because the hybrid battery assemblywill be discharged. When you leave your vehicle, put thehybrid transaxle in “P” and set theparking brake. Be sure to carry the keywith you and lock all the doors. If you leave the hybrid system in “ACC”or “IG−ON”, the hybrid system may notstart because the 12 volt battery will bedischarged. If the vehicle is parked for a long time,the hybrid battery will discharge gradually.To keep the hybrid battery in good condition,drive the vehicle at least once everyseveral months for at least 30 minutes orten miles. If the hybrid battery becomesfully discharged and the vehicle will notstart even with a jump−start to the 12 voltbattery, contact your Toyota dealer. 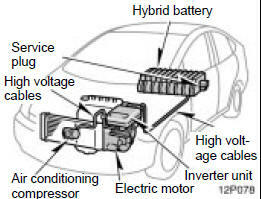 When you leave your vehicle, besure to shut off the hybrid system. Be sure to put the hybrid transaxlein “P” because the vehicle can startwith the “READY” light on and theengine stopped (no engine soundand vibration). When the “READY”light is on, if you leave your vehiclein shift position other than“P” and “N”, the vehicle will creepand start abruptly with the acceleratorpedal being depressed by mistake.This may cause death or seriousinjury. When the multi−information displayshows this message, the master warninglight comes on in the instrumentcluster. Read the message andfollow the instruction. When you leave your vehicle, or stopor park for a while, put the hybridtransaxle in “P”. Charging is necessary. In “N”, chargingwill not be applied. The electric generatoroperates in “P”, “D” or “B”. If youcontinue driving, put the hybrid transaxlein “D” or “B” and depress theaccelerator pedal. Do not leave the hybridtransaxle in “N”. When driving intraffic jam, operate in “D”. Do not allow anyone to lean against theside of the rear right seatback, nor putany luggage or other obstructions on it. An air vent is provided on the side ofthe rear right seatback to cool the hybridbattery. If this vent is covered, thehybrid battery will overheat resulting ina reduction of the output performanceof the hybrid system. The seat belt not properly set in theguide on the top of the rear seat mayblock the air vent. Be sure to pass theseat belt through the guide properly. Do not wet or put foreign objects overthe air vent. Otherwise, the hybrid batterymay be adversely affected and bedamaged. You may hear a cooling fan noise fromthe air vent. If water is used to wash the inside ofthe vehicle or inside the luggagecompartment, or a large volume of wateris spilled in these areas, the hybridbattery may be damaged, or a shortcircuit may occur. For vehicle repairs or maintenance, besure to consult your Toyota dealer. If your vehicle is beyond repair becauseof accident or something, be sure toconsult your Toyota dealer. As sealed Nickel−Metal hydride batteriesare used, be sure to consult your Toyotadealer when disposing of your vehicle. If you are involved in an accident,follow these precautions. Move the vehicle to a safe placeand perform the followings to reducethe risk of high voltage electricityleakage. Depress the brake pedal and applythe parking brake. Press the “P” position switch andstop the hybrid system. If the key is inserted into key slot,remove it. If your vehicle has experienced majordamage, you may get an electricshock. To prevent this, never touchthe high voltage parts (hybrid batteryassembly, etc.) or cables(orange color) connecting theseparts. If some exposed electricwires are protruding inside or outsideof the vehicle, an electricshock may also occur. Never touchthem. If the fluid leaks or gets in somepart of the vehicle, never touch itbecause it may be electrolyte(strong alkali) from the hybrid battery.If it gets on your skin or eyes,wash off immediately with a largeamount of water, if possible, withboric acid solution, and get immediatemedical attention in order tohelp avoid serious injury. If a vehicle fire occurs, extinguishit using a fire extinguisher for theexclusive use on electric fires. Asa small amount of water may bedangerous, use a large amount ofwater, for example from a fire hydrant,or wait for a fire−fightingteam arrival. If your vehicle needs to be towed,do it with the front wheels or allfour wheels raised. If the frontwheels are on the ground whentowing, the electric motor may continueto generate electricity whichcould leak electricity. A fire couldoccur depending on the degree ofdamage. See “If your vehicle needsto be towed” on page 376.